Saracens fly-half Owen Farrell kicked all 18 of his side's points as Premiership champions Harlequins suffered their first loss this season. The game was finely balanced throughout and Danny Care's try shortly before half time gave Quins the slight advantage after Nick Evans and Owen Farrell duelled from the tee. The kicking battle resumed after the break as the lead swung back and forth. But Evans missed four shots from the tee that cost his side dear. The result means that Northampton are the new Premiership leaders, with Quins dropping to second, while Sarries, who move back into the top four, have now played 260 minutes without scoring a try. A superb opening 10 minutes, with both sides displaying classy touches, saw the score tied at 3-3 although Evans's second attempt from tee came off the upright. The Kiwi, who started the game with a 92% kicking success rate, made amends on the quarter of an hour when Rhys Gill was caught offside. Referee Andrew Small was closely policing the breakdown and when George Robson failed to roll away he handed Farrell an easy chance in front of the posts which he landed to square the score once more. Joe Gray was forced to leave the field with a bad eye injury on the half hour, replaced by Rob Buchanan, and, with plenty of incident off the ball, brutal tackles were flying in on both sides in what had become a hugely physical contest. Ollie Kohn saw yellow for not retreating 10 metres for Richard Wigglesworth's quick penalty and Farrell's strike made it 9-6 to Sarries. With half time approaching, and both sides equally matched, Care grabbed the opening try after referee Small signalled advantage to Quins at the ruck. The England scrum-half darted under Petrus du Plessis's tackle to go clean through and although the score was not referred to the video official replays showed Care had knocked the ball on at the base. Evans converted in front of the posts for a 13-9 lead that was harsh on Sarries. Kohn returned soon after the break but Farrell soon made it a one-point game after Matt Hopper got isolated. 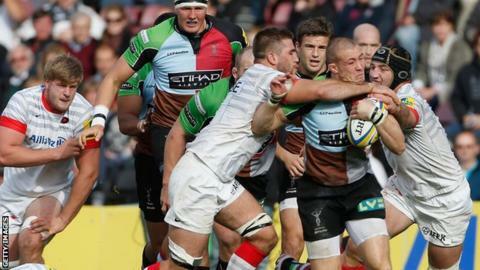 The game opened up after a fine midfield break and chip to the corner by Schalk Brits, which Sarries could not gather. Quins collapsed an excellent catch and drive from Sarries on 53 minutes and Farrell was on song once more after Evans had sent another easy shot awry. Evans missed a third shot at goal on sixty minutes when George Kruis was sin-binned Evans made it 16-15 from infront of the posts. Charlie Hodgson came on with 12 minutes to go, with Farrell moving outside, but with the man advantage the hosts' pack kept it tight. They won a 71st-minute penalty but Evans was wayward again and his terrible up and under from the restart led to Mike Brown handling the ball in a offside position. Farrell, who came into the game with indifferent kicking form, stepped up to make it six from six and clinch victory. "It's a big relief. In the last couple of weeks we have lost ourselves a bit. "We talked about ourselves and and what we're about as a club but we've found ourselves today. "Owen [Farrell] came into this match under a little bit of pressure from you guys [the media] but he's an international player so there were no worries there." "[On Evans's missed kicks] Of course it would have been completely different but he's won a million games for us and hopefully he'll win a lot more. "We gave them six penalties and they kicked six penalties. It became the game they wanted in terms of flow but that's a credit to them. "It wasn't a good game of rugby at all but it was tight. We never get carried away when we win, we're not going to get carried away when we lose." Harlequins: Brown; Stegman, Hopper, Turner-Hall, Monye; Evans, Care; Marler, Gray, Johnston; Kohn, Robson; Guest, Robshaw, Easter. Replacements: Buchanan for Gray (28), Matthews for Kohn (54), Fa'asavalu for Guest (54). Saracens: Goode; Ashton, Tomkins, Barritt, Wyles; Farrell, Wigglesworth; Gill, Brits, Du Plessis; Borthwick, Hargreaves; Brown, Fraser, Joubert. Replacements: Strettle for Tomkins (53), Hodgson for Wyles (69), Spencer for Wigglesworth (74), Vunipola for Gill (49), Smit for Brits (63), Stevens for Du Plessis (45), Kruis for Hargreaves (54), Saull for Fraser (72).